The exact date for many holidays and festivals in Thailand is determined by the lunar calendar, but two important events usually fall in July. The first is Asahna Bucha which commemorates the day on which the Lord Buddha delivered his first sermon. The second event comes on the day after Asahna Bucha and is known as Wan Khao Phansa. This day marks the start of the Phansa rains retreat period for monks. Lasting for three months, this is sometimes referred to as Buddhist Lent and is a popular time for Thai boys and men to become temporarily ordained as monks. It’s also a time when Thai Buddhists donate candles to their local temple. Before the advent of electricity, monks restricted travel during the rains retreat period. With the monks spending most of their time studying scriptures within the confines of the temple, they relied on candles for light. Over the years this simple act of donating candles has developed into colourful parades. The parading of candles to temples takes place at various locations around Thailand, but the biggest and most elaborate event takes place in Ubon Ratchathani in north-east Thailand. Although June marks the start of the rainy season for many areas of Thailand it’s usually in July, particularly the latter part of the month, when rainfall levels steadily begin to increase. 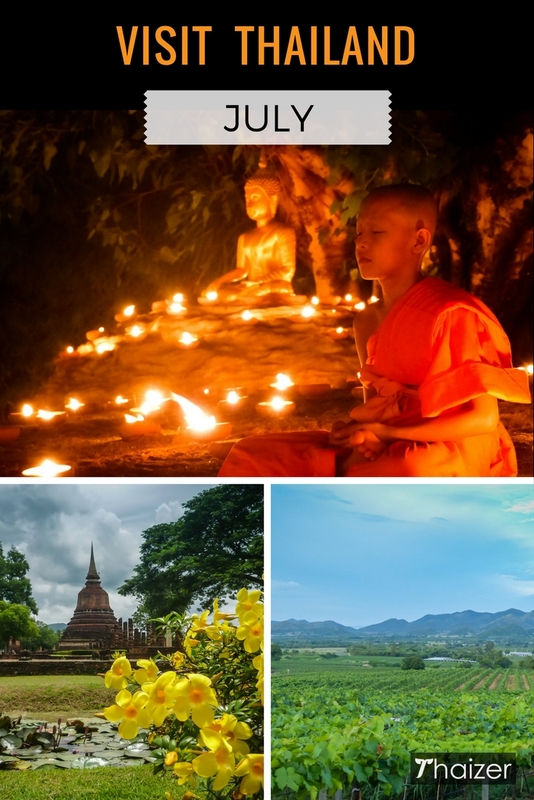 That certainly doesn’t mean your trip is going to be ruined by the weather and it can still be an excellent month to visit especially if you are exploring inland areas of Thailand. You can expect to see some rain wherever you travel to in Thailand in July, but downpours tend to be short and sharp with lengthy spells of sunshine mixed in amongst the showers. The wettest months of the rainy season are normally August and September rather than June and July. Average minimum and maximum temperatures in July are consistently high throughout Thailand. Humidity levels are high too and it’s important to keep hydrated and even on cloudy days it’s wise to practise good sun safety. Which is the best Thai island or beach resort to visit in July? If you look at the weather table above you’ll notice that the statistics show that the Gulf Coast of Thailand (e.g. Hua Hin, Ko Samui) sees much less rainfall in July compared to the opposite Andaman Coast (e.g. Krabi, Phuket). And over on the Eastern Seaboard, there are vast differences in the amount of rainfall with Ko Chang seeing an abundance and Pattaya relatively little. You can be lucky or unlucky with the weather during your visit in July, but the better weather on the islands can generally be found on Ko Samui, Ko Pha Ngan, Ko Tao and Ko Samet. For beaches on the mainland, Hua Hin, Cha Am, Pranburi, Prachuap Khiri Khan, Khanom and Pattaya are all good choices. If you’re visiting the southern islands, particularly in the Andaman Sea, pay attention to any red warning flags which prohibit swimming. There are fatalities every year during the rainy season when visitors ignore the warnings and get into difficulty because of unpredictable swells and riptides. Jellyfish are also a potential hazard at some beaches during the rainy season. Warning signs are posted on beaches and at hotels when there is a risk. Some boat services to the smaller islands in the Andaman don’t operate in July and some attractions, such as the Emerald Cave at Ko Mook in Trang, are off limits to visitors until October. Asahna Bucha Day (usually falls in July) – public holiday in Thailand commemorating the day on which the Lord Buddha delivered his first sermon over 2,500 years ago. Wan Khao Phansa – falls the day after Asahna Bucha and marks the start of the three-month long Phansa rains retreat. The retreat period ends in October with Awk Phansa. Ubon Ratchathani Candle Festival – associated with Asahna Bucha and Buddhist Lent. Phuket Yachting Race Week (mid-July) – regarded as one of the best regattas in Asia, Phuket Race Week is hosted at the Cape Panwa Hotel in Phuket. Birthday of HM King Maha Vajiralongkorn (Rama X) – July 28 (public holiday).